Connect your PDA to a Wireless Network. 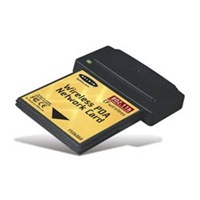 This high-speed card provides you with an innovative wireless networking solution that is easy to set up and use. The card transmits at a rate of 11, 5.5, 2 or 1Mbps to let you share files and printers on the network-without the hassle and inconvenience of connecting wires! Operating in the ISM band using Direct Sequence Spread Spectrum (DSSS) transmission, the card implements the IEEE 802.11b standard and supports many devices running the Windows CE operating system. Download 1, Download 2, version: n/a, OS compatibility: Pocket PC 2002, size: 3.9Mb. Download 1, Download 2, version: n/a, OS compatibility: Pocket PC 2003 size: 1.9Mb.